The acquisitions represent a new strategy for Ambani’s Reliance Group, whose founder — his father Dhirubhai Ambani — built a petrochemicals business and the world’s largest oil-refining complex from scratch. It’s a clear pivot toward consumer offerings in a country that’s becoming a battleground for giants such as Amazon.com and Walmart’s Flipkart Online Services. The acquisitions will help bolster this network of partners. 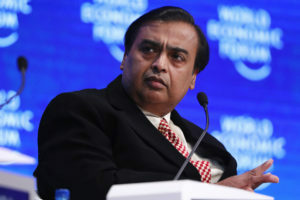 Last week, Reliance said it would spend 7 billion rupees ($101 million) to buy and fund the expansion of Haptik Infotech, a company that provides customer support chat services using artificial intelligence.